Multi travel adapter with safety universal socket, meet European new quality standard test,Multi travel adapter Current output 2.1A Dual USB interface, support for mobile phones and tablet PCs simultaneously.electrical plug is combination of global multi-socket, phosphor bronze electrodes, gloss, high conductivity, fast heat dissipation, etc.wholesale Multi travel adapter metal material suitable for the manufacture of parts of the pins, and enhance the product's safety but also enhance the life of the product. portable cell phone charger for mobile photos,MP3,MP4,Bluetooth,etc .Low-voltage electronic products.Hotel,office,business class,home,etc,are available. A,Logo printing:provide excellent printing so that you can have the logo or something you like on the surface of the power adaptor. 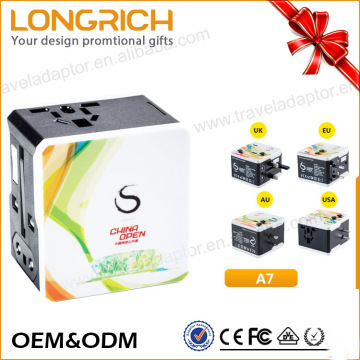 B,color design: Different color are available.ac dc adapter,it is better to just buy the best item for the value that it represents to you and your lifestyle especially favored by lady users. C,package design: Our Normal pack Of Universal Adapter Is PP Bag + Small White Box . Gift Box , ylon Bag , Blister Card , power adapter OEM Packages Are Available! No matter which country you travel to, is a good choice for you. Safety shutter protect children against touch. 4 226 workers,boast a monthly capacity of 50,000pieces. Q1 How fast can i get the quotation? A We usually quote within 24 hours after we get your inquiry. If you are very urgent to get the price, please call us or tell us in your email so that we will regard your inquiry priority. Q2 How can I get a sample to check your quality? A After price confirmation, you can require for samples to check our quality. Q3 What kind of logo files do you accept for printing? A PDF, Core Draw, Ai. Q4 Can you do the design for us? A Yes. 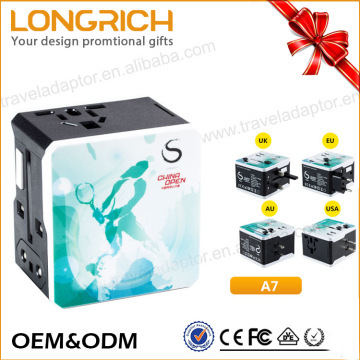 We have a professional team having rich experience in Travel Adapter design and manufacturing. Just tell us your ideas and we will help to carry out your ideas into perfect usb charger adapter. It does not matter if you do not have someone to complete files. Send us high resolution images, your Logo and text and tell us how you would like to arrange them. We will send you finished files for confirmation. Q5 What about the lead time for mass production? A Honestly, it depends on the order quantity and the season you place the order. The lead time of 500pcs is about 8 working days. Generally speaking, we suggest that you start inquiry two months before the date you would like to get the products at your country. Q6 What is your terms of delivery? A We accept EXW, FOB, CIF, etc. You can choose the one which is the most convenient or cost effective for you. Longrich is located in Dongguan changan, It covers an area of 4000 square meters. We have 226 workers, boast a monthly capacity of 50000 pieces and defective rate within 0.02%. All of our Multi travel adapter quality standards. Since establishment in 2002, we always strive on technology innovation, and have become now an industry leader with independent R&D forces , reliable quality and competitive price. Through 10 years relenting efforts and innovation, we walk in the forefront of the market with clients from over 39 countries and regions in the world. If you are looking for a long-time partner with strong R&D and quality control capability. Please contact us ! OEM & ODM orders are welcome as well. 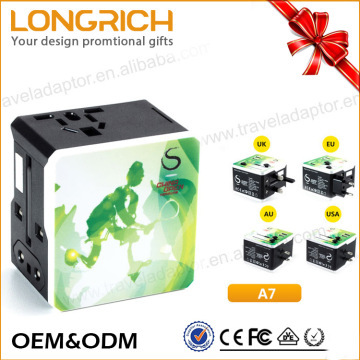 All of our products ,Multi travel adapter,reach international quality standards,such as CE,LVD,EMC,RoHS and FCC,etc.moreover,our products have got the Utility Model Patent Certificate and Design Patent Certificate,etc. 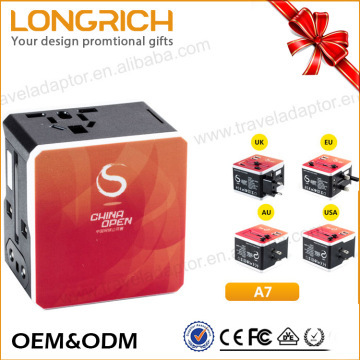 our products Multi travel adapter have shown in lots of exhibitions.As you can see from the pictures.attend the ces fair from 2010 in USA,The 21st session of shenzhen gift show,The Hong Kong electronics fair (spring 2013 and international information technology exhibition,etc. we got the customers from all over the world.thanks for longterm cooperations with us. our R&D team is composed of 15 senior structure,mold and electronics engineers.from draft design to proofing,we only need 20 days.we have 226 worker,boast a monthly capacity of 50,000 pieces and defective rate within 0.02%. Our factory cooperate with a number of global logistics companies, in order to make the products be able to transport to all over the world, we have maintained cooperative partnership and common logistics company.UPS/PHL/TNT/EMS/Fed EX choose the shipping way as you wish. 1, to determine pay 30% deposit after order. 2, full payment before shipment. 1, China within the logistics can be specified by you. 2, the export of international exports of goods in Hong Kong. newest ADAPTERpacking details: normal packing way:small white box+pp bag+manual of course,special packages are greatly welcomed such as gift box,nylon bag. The major production base now has 260 employees and the plant area is up to 6000 square.Besides,LongRich has our own team of product R ,which include experienced structure designers,mold designers and electronic engineersso that can guarantee our product. Factory Info: Dongguan LongRich Electronic Co., Ltd. The major production base now has 260 employees and the plant area is up to 6000 square.Besides,LongRich has our own team of product R&D,which include experienced structure designers,mold designers and electronic engineersso that can guarantee our product.